I chat a bit about these in this post. How this scarf came to be. Chattering on about the wonderful Malabrigo and how it just had to be a hat in this post. A bit more about the mittens made to match the Sade hat. The post for these mitts is here. 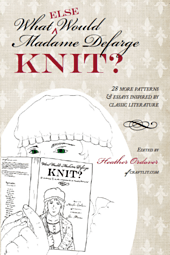 Two mitts patterns in What (Else) Would Madame Defarge Knit? I talk about these mittens in this post. No post about these (wonder how that slipped by me? ), but the pattern was released mid-September 2011 and to download the PDF, just click on the name above.